Serving Southbank for more than two decades. As one of only two remaining Southgate restaurants to have operated since the centre’s opening in 1992, Christine Yong and the team at Red Emperor know a thing or two about Southbank. While the restaurant was originally established on level 3 at Southgate, it relocated to level 2 three years ago and is still the community’s staple choice for authentic Chinese cuisine. Having been at Red Emperor since the very beginning, general manager Christine Yong said she and the team still love what they do just as much as when they first opened. “I’ve been here for more than 20 years and I still love it. Sometimes when we sit down after all the guests have gone and have supper, we simply sit around and forget we need to go home,” she said. 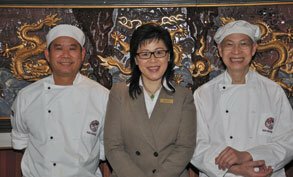 Red Emperor’s authentic Chinese flavours can be attributed to its long serving head chef Hon Kau Hui who was with the restaurant for 18 years. Christine explained that following the restaurant’s move to level 2, Kau had initially left the business as it underwent a change in ownership, which was much to the disappointment of many Red Emperor regulars. However, since recently returning to his post a few weeks ago, Christine said the regulars and the rest of the team couldn’t be happier to have him back. Along with recent return of long serving dim sum chef Kam Tai Ho, the Red Emperor kitchen is becoming renowned again for its authentic yum cha and Chinese menu. With every morsel made fresh in house every day, it’s no wonder Red Emperor’s yum cha is considered to be one of Melbourne’s best. Besides its daily yum cha, some classics include Peking Duck, Crispy Five-Spice Roast Berkshire Pork Belly, Twice-Cooked Spicy Quail and Spicy Salt & Pepper Calamari. These and many others have long been popular choices for many residents and workers in the precinct. Located along the scenic banks of the Yarra within touching distance to the Arts Precinct, Christine said she and her team couldn’t imagine working anywhere else.